If you’re among the 36 million people in the U.S. who have migraines, you know that it’s important to learn what you can do to manage these often debilitating headaches. Working with your doctor, you can develop a personalized plan to manage migraine triggers, reduce the frequency of these attacks and find treatments that provide relief from pain and other symptoms. The symptoms of a migraine attack can range from moderate to severe and can include pain on one side of the head, throbbing pain, sensitivity to light, sounds, and smells, nausea and vomiting, blurred vision, diarrhea, and light-headedness or fainting. Attacks can last for hours or days, with the typical migraine lasting four to 72 hours. While no definitive cause has been identified, researchers have found that these headaches can be linked to expansion of blood vessels in the brain, changes in the brainstem and how it interacts with the trigeminal nerve (a major pain pathway), and changes in dopamine and serotonin levels. New research suggests that migraine may not be solely a blood vessel disorder, rather it can be understood as a sensory perceptual disorder because of the effect that it has on sight, sound, smell and hearing. During migraine attacks, researchers noted that people also frequently experience trouble concentrating, changes in appetite, mood changes, and alterations in sleep patterns. Scientists have also discovered several genes that may be linked to migraine, which may be why four out of five people with migraine have a family history of this type of headache. In addition, some studies have linked being overweight with an increased risk of migraine. In addition to prescribing medications to prevent and stop migraine headaches, your physician can help you identify your triggers and lifestyle factors that may increase the number of migraines you experience. One lifestyle change that may help is changing what and when you eat. Researchers have found that a drop in blood sugar precedes the onset of migraine in some patients. To avoid swings in blood sugar, physicians recommend avoiding sugar, refined carbohydrates, caffeine and alcohol. They also suggest eating several small meals a day to maintain a more consistent blood sugar level. Food allergies may also trigger migraine. Studies have found associations between salt intake and drinking cows’ milk and migraine. Other potential food triggers uncovered by researchers include the artificial sweetener aspartame and tyramine, a natural compound found in a range of aged, dried, cured, or fermented foods such as soy sauce, salami, and cheese. There are a number of promising new treatments in development. One recent study found that a minimally invasive, trans nasal, image-guided application of lidocaine to a group of nerves situated behind the nose known as the sphenopalatine ganglion provided ongoing relief even after the lidocaine wore off. Thirty days after the treatment, patients reported that their pain levels were 36 percent lower than before treatment and 88 percent said they were using less or no migraine medication. Another new approach to migraine management was approved by the FDA last year—a battery-powered headband that delivers an electrical signal through the skin to the trigeminal nerve. In a study, the device prevented migraine in 67 percent of trial participants. 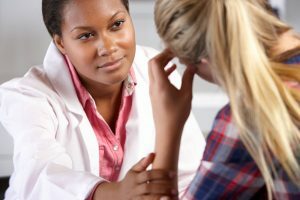 Making a health advisor part of your team can help you find a specialist with expertise in treating migraine and help you stay abreast of the latest, evidence-based treatment approaches to lower the number of migraine attacks you have and relieve the pain of the headaches that do occur.